It is a privilege to write the foreword of his book, which deals with the art and science of Tabla Playing, written by none other than the eminent scholar, music writer and accomplished Tabla guru, Pt. Vijay Shanker Mishra. Pt. Vijay Shanker, trained under the tutelage of his illustrious father Pt. Gama Maharaj, belongs to long lineage of Tabla players of the Banaras Garana. Though himself a traditionalist, Vijayji uses contemporary research methodology to analyse the Tabla, Tabla playing, its origin and its development over the centuries from a modern perspective. A veteran writer and a musicologist of repute, he has to his credit more than 5000 articles and publications. Pt. Vijay Shankar Mishra also presented a 13 – episode serial on the "History of the Tabla", which was broadcast by All India Radio. In this Programme, Vijayji looked into many of the theories and stories regarding the origin of the Tabla. Separating history from myth and lore for the first time, Vijayji demonstrated how many of the prevalent beliefs regarding the origin of the Tabla were more myths or "gathas" (stories). He went on to put forth a theory regarding the origin of the Tabla and the development of various playing techniques, by textual and other forms of evidence, which has been generally accepted by Tabla players, scholars and connoisseurs alike. Translated into English by Debasish Chakraborty, this present work is a continuation of his previous efforts. 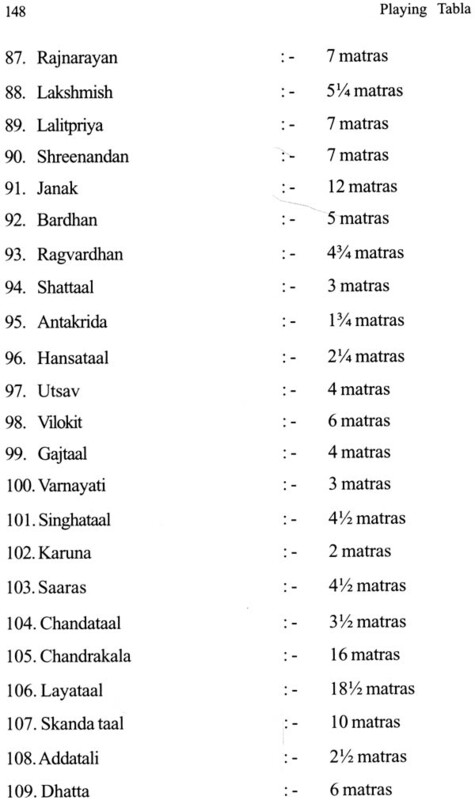 In this book Vijayji writes about 35 Taalas, including some very rare Taalas. 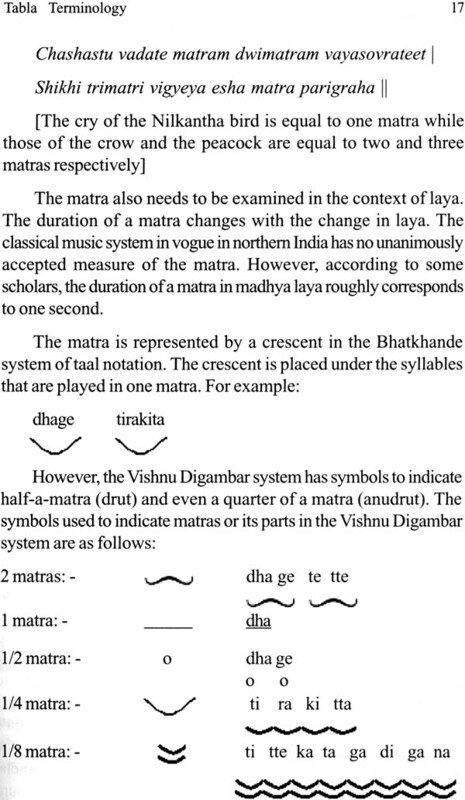 Also this book contains rare compositions by the Master of different Gharanas. 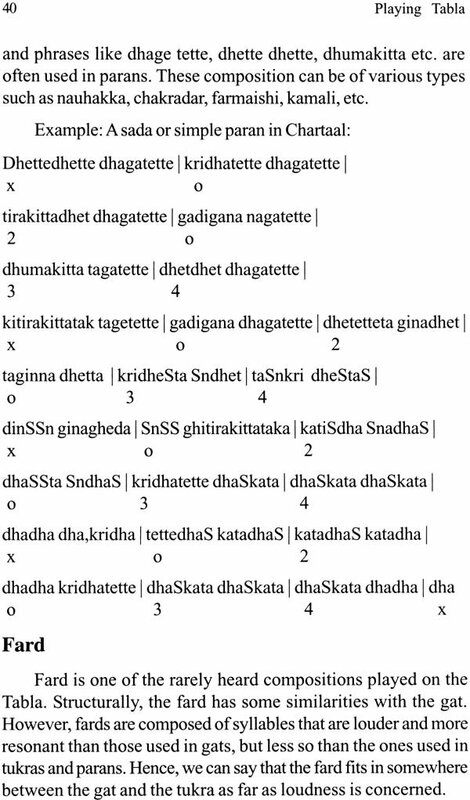 He also covers the Gharanas and their Vaadan styles and their particular compositions along with the Varnas (alphabets) of the ancient Tabla with reference to Bharata's and sharangdev's Sangeet Ratnakar. 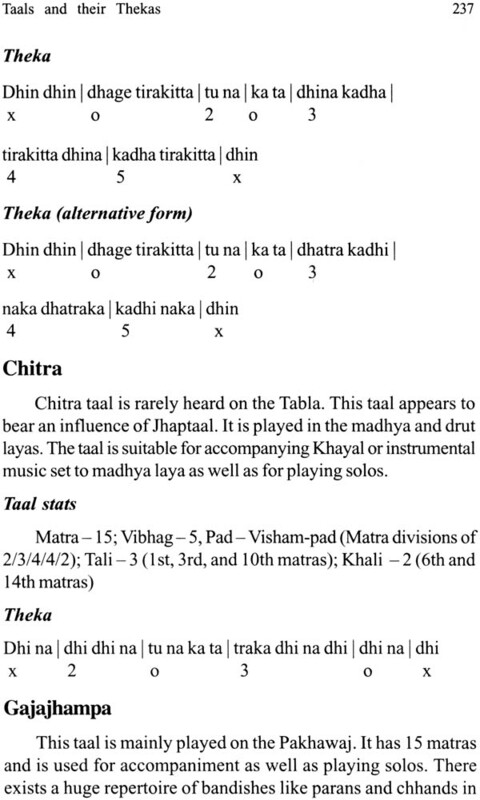 The book also refers to various playing techniques and the 'moods' of the Tabla, the three notation systems of Indian music and the staff notation, while throwing light on what should be a Tabla solo recital and Tabla accompaniment. 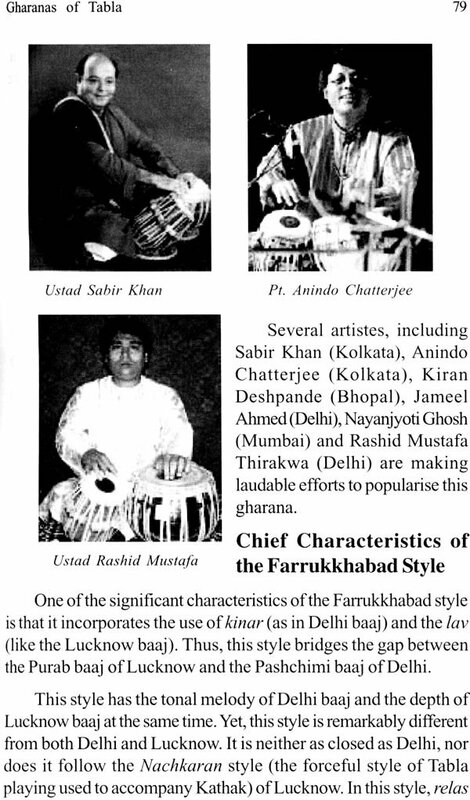 Finally the book provides brief biographies of some of the Tabla greats and in a first discusses some promising contemporary Tabla players as well. With its wide range and in depth coverage of topics, this is a store house of information on the Tabla from a modern perspective. The book will be a valuable reference to all those who want to learn about the Tabla and tabla playing from a modern perspective – connoisseurs, scholars and experts. Students, especially at the post graduate level would find it particularly useful for their studies. I Pray that Pt. Vijay Shanker Mishra continues with his efforts to enlighten us with his research and wish him luck for all his future endeavours. 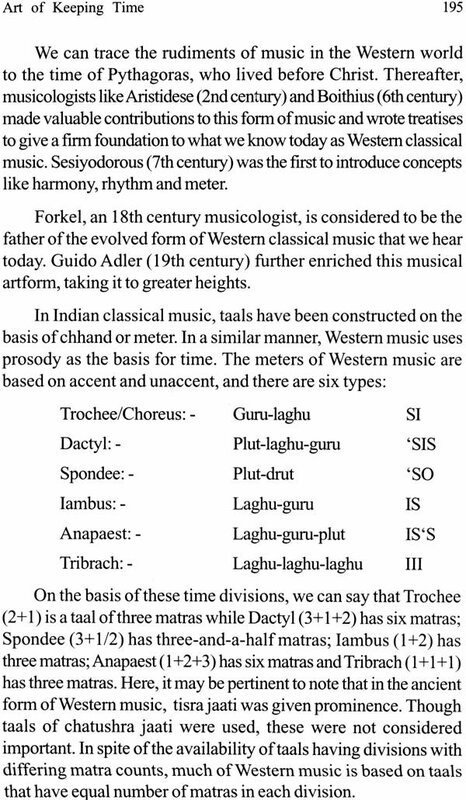 Indian's incredible musical heritage is seeped in antiquity. The history of Indian music is said to be over 5,000 years old. In contrast, the Table, as we know today, is a fairly new entrant in the musical arena, having made its debut barely 400 years ago. However, in this short span, this instrument has acquired unprecedented acclaim and popularity. Today, a Hindustani musical concert is inconceivable without the Tabla gracing the stage either as a solo instrument or as an instrument of accompaniment. The popularity of the Tabla has long crossed the shores of India and has earned the appreciation of music lovers across the world. A significant number of Tabla lovers in foreign lands are now seriously pursusing the art of Tabla playing, and some have become quite successful. The credit for the Tabla's popularity goes to the legions of gifted, but often unsung, Tabla exponents who have dedicated their lives to explore this deceptively simple instrument. They have braved harsh social and political conditions, abject poverty, apathy, neglect and even the wrath of the society to steadfastly pursue, preserve and propagate the sacred art of their forefathers till their last breath. The Tabla's evolution, in the course of time, resulted in the creation of several distinctive traditions each with its own set of history, heroes, legends adn wealth of magnificent compositions. Until quite recently, this tradition knowledge was fiercely guarded and handed down orally from master to disciple through a gruelling Process of training that spanned decades. This approach certainly had its merits. Indeed, it is impossible to acquire mastery over the Tabla, except under the tutelage of a true guru. However this process of training had its drawbacks: the lessons went unrecorded, and free learning and holistic appreciation of this wonderful instrument remained restricted. The availability of printed books improved the situation to a certain extent – thanks to the herculean efforts of stalwarts like Pandit Vishnu Narayan Bhatkhande and Pandit Vishnu Digambar paluskar. However, even today, books on Indian classical music are few, and on Indian percussion instruments like the Table are fewer still. 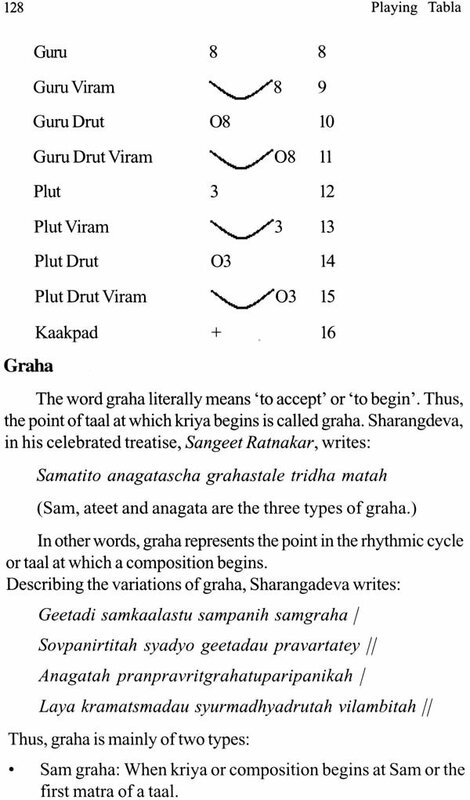 There is a dearth of books that lucidly explain the theoretical and practical aspects of the North Indian system of drumming, even in vernacular Indian languages. Many of these books are either woefully inadequate in their treatment of the subject or blatantly propagate myths and fallacies. The plethora of controversies surrounding various technical aspects of the Indian system of drumming and the lack of recorded historical evidence add further complexity. In such a situation, the students, practitioners, teachers and connoisseurs of the Tabla – especially those who speak and understand English – find themselves at a loss. Pandit Vijay Shanker Mishra, a representative of the Banaras gharana, and a living encyclopedia of Indian classical music, has been making determined efforts to rectify these anomalies through his incredibly insightful research and prolific writings. 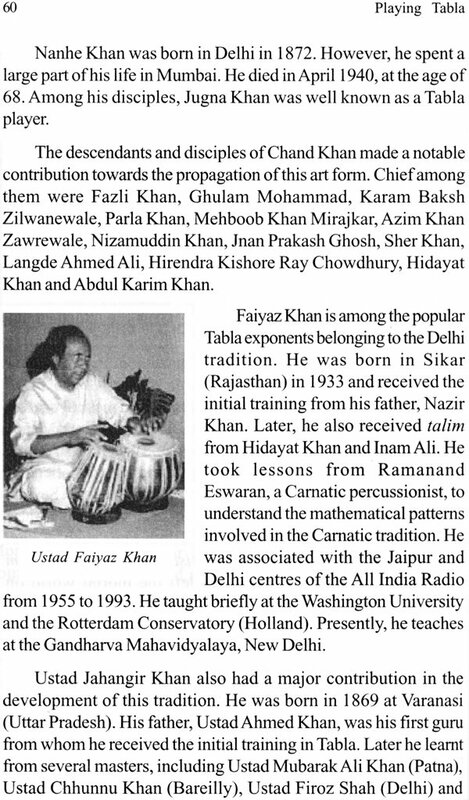 Encouraged by the response to his works, which are in Hindi, he envisioned yet another courageous project: to create a comprehensive book in English that included his original research on the Tabla so that a formidable barrier to free knowledge that of language can be conquered. It was with this noble intent that Panditji entrusted me with the task of translating his writings and helping compile his works in the form of a book. The task was daunting as music are difficult to explain in English. Moreover, it is impsible to emulate Panditji's powerful style, originality and in depth understanding of the subject for anyone, let alone a novice with inadequate musical and linguistic capacity like me. However, with Panditji's blessings, guidance and encouragement – and after toiling relentlessly for more than seven years the task has been finally accomplished. This book attempts to fill a void that students, teachers and practitioners have felt for long. It not only provides a firm theoretical foundation based on historical facts and sound logic, but also contains an incredibly rich repertoire of compositions of various schools of Table. Beginners as well as fairly advanced students, practitioners, academics and even researchers will find may interesting nuggets in the pages that follow. Working on this book was an enriching and enlightening experience for me. I sincerely hope that the readers will enjoy this book and benefit from it as much as I did while putting it together. I shall consider my efforts truly rewarded if this book serves the intended purpose of the another and my guru – Pandit Vijay Shanker Mishra – which is to make comprehensive, objective and accurate knowledge of the Tabla accessible for every discerning lover of the Tabla. By the grace and blessings of the Almighty and the Gurus, I humbly present before the esteemed readers my 6th book, Art and Science of playing Tabla. I hope and pray that readers will bestow upon it the same affection as they have on my previous books, Antarnad: Sur aur Saaz, Tabla puran, Bharatiya Sangeet ke Naye Aayam. Manke: Bhav, Sur Lay Ke and Rare Compositions of the Great Masters. This book is in fact the result of incessant requests from readers. Soon after the publication of Tabla Puran, I began receiving requests for a smilar book in English. Since English is neither my language of expression nor of my thinking process, I kept ignoring these requests for some time. Meanwhile, several books on the Tabla were published in English, and I felt no need to add another volume on the same subject. But when requests kept pouring in despite the slew of new books hitting the market, and the telephone bell refused to stop ringing, I could not ignore those any more. Treating the will of my readers as their command, I decided to take up the task. I took help of my disciple, Debasish Chakraborty. I do not consider myself a Guru, though. After completing his MA in table, Debasish took up a regular job with a private company. Table is not his profession. And, considering the plight of music and musicians, I did not ask him to change his mind either. In spite of the pressures office work and domestic life, Debasish completed the task of translating my writing in about seven years. Thereafter began the process of the book's publication. I am honoured to note that the Publications Division, which had earlier published Manke: Bhav, Sur Lay Ke, evinced interest in this work as well. However during this period, I felt the urge to add some more content to the book to enhance its utility. Another student of mine. Madhukhar Narayan, took up the responsibility of working on the new pieces. Madhukhar is an engineer by profession and has completed his MA in Tabla. He proof read the manuscript and helped with the scanning of photographs. My other student Puneet Batra, glyadly helped with typing and other production related work. I am grateful to these individuals and have no qualms in admitting that this book is the result of their efforts. I would have found it difficult to accomplish it by myself. I would also like to clarify at this point that several books have been written on the Tabla by eminently knowledgeable persons for knowledgeable readers. This book, however does not belong to the same league. This book has been written by an ordinary teacher for the students of table. It has no airs about it and steers clear of all intellectual pretentions. The book intends to offer only as much as students of music preparing for examinations require, in manner that they can understand. I am indebted to the world famous Sarangi maestro, pandit Ram Narayan and Padmashri Pt. Bhajan Sopari for gracefully grateful to those great artistes whose views and compositions have been incorporated in this book. I also thank the editor in particular and other members of members of the Publications Division who were involve in producing this Publications Division who were involved in producing this book. And last but not the least; I thank all my readers, for whom so many people have toiled to accomplish this great task.